Chihuly first filled boats with glass in Nuutajärvi, Finland, during the “Chihuly Over Venice” project in 1995. After several days of glassblowing, Chihuly started tossing glass forms into the Nuutajoki river to see how they would look in the environment. 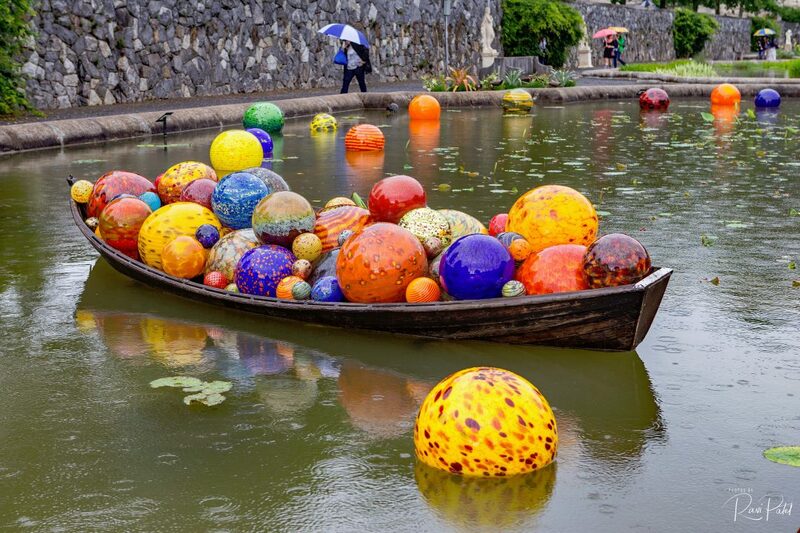 As the glass floated downstream it was retrieved in wooden boats by local teenagers, inspiring Chihuly to begin massing forms into wooden boats, creating what would become the Boat series. Named for the island of Niijima in Tokyo Bay, and for the small Japanese fishing floats Chihuly would find on the shores of Puget Sound as a child, Niijima Floats are very likely the largest glass spheres ever blown (up to 40 inches in diameter and up to 80 pounds). The Floats are generally displayed in groups, either indoors or outdoors. New Floats were blown for the Biltmore exhibition. This entry was posted in art, North Carolina, Photography and tagged Biltmore, boat, Chihuly, glass. Bookmark the permalink.